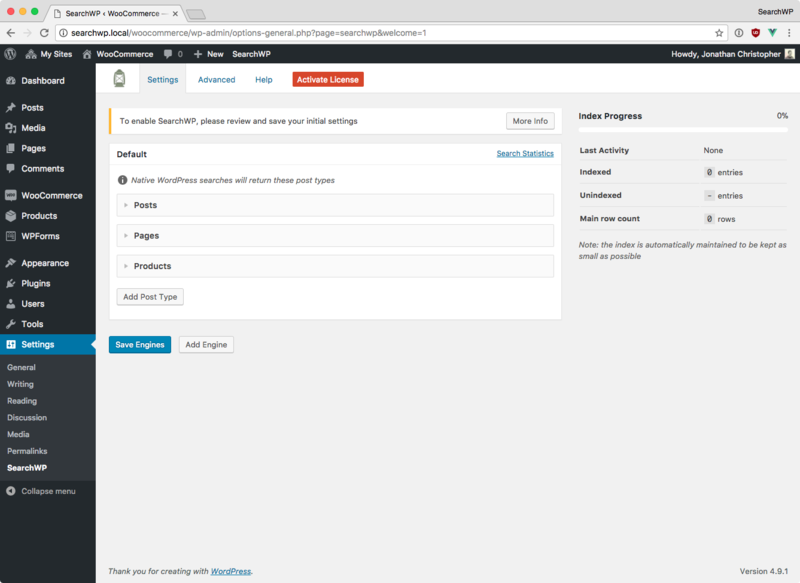 Installing SearchWP follows the same process as any other WordPress plugin. When you purchase a license for SearchWP, you will receive a link to download the latest version. You can either upload that ZIP file within the WordPress admin or upload via FTP and activate SearchWP. By default there is a single search engine available. This will be used when taking over native WordPress searches. Note that only the post types listed in the configuration will be included in search results. You can add additional post types by clicking the Add Post Type button. Here you can weight various content attributes (e.g. Title, Content, Slug, etc) and also add any number of Taxonomies and Custom Fields for that post type. Once the index has been built, SearchWP will be fully functional. The index is automatically kept up to date in the background. Default WordPress searches are hijacked by SearchWP and its results are injected into WordPress’ native search routine. You do not need to edit your search forms, your search results page, search Widgets, or anything. 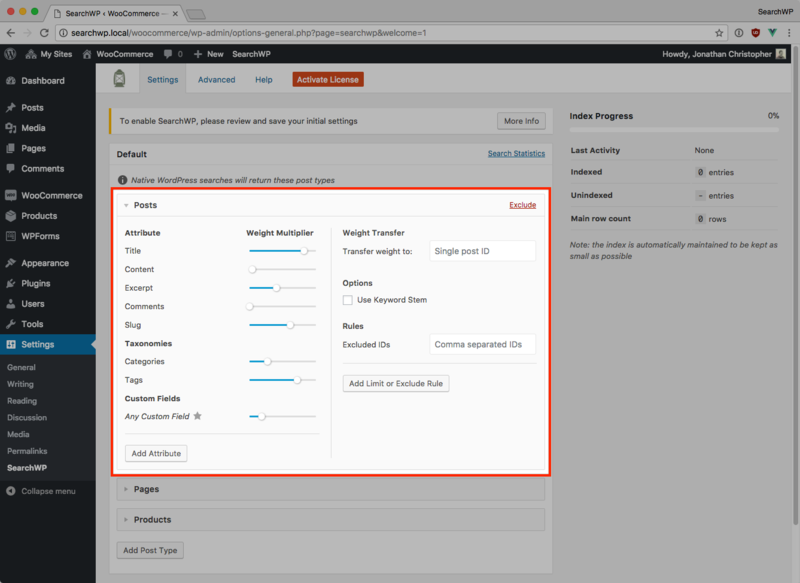 Because of the way SearchWP returns results to native WordPress search queries SearchWP results will be processed by your theme’s search results template in the same way results were displayed prior to activating SearchWP. Once activated, you’ll notice a button on the SearchWP settings screen allowing you to enter your site license and activate it. This will enable automatic updates and also make support ticket creation available on the Help tab of the SearchWP settings screen.